It’s 2017. What’s the Value of Cold Calling in Sales? The Internet is buzzing with hype about how cold calling is dead. In the last few weeks, I’ve seen multiple studies, surveys, polls, etc., about how cold calling is a technique that is dead. I’m going on a serious rant about this subject. Stick with me on this issue and then hey, go ahead and let me hear from you. “Cold calling is dead” is not a universal truth! Let’s be blunt. The people who buy this belief are the ones who are too lazy or too scared to get on the phone and make phone calls. I’m not saying cold calling is the “go to” prospecting strategy for everyone or for every type of industry. What I am saying is let’s not go throwing the baby out with the bath water. The reason so many people have come to believe cold calling is dead is because they have stuck in their head a stereotype image. Let me paint the picture in your mind. It’s a B2C telemarketing call from a person with a bad accent reading from a script who is clueless as to what they’re selling, and they are incapable of answering a question. Yes, it’s a pathetic image, but that’s the perception people have about cold calling. Let’s make cold calling what it should be. One person talking to one person. It’s not script driven. It’s a conversation; yes, many times, it’s a brief conversation, but it’s still a conversation. The biggest thing is the conversation is about the person being called, not about the person making the call! When we throw away the stereotype and re-think the process, then it takes on a completely different definition. Industrial sales where you’re selling supplies your customers buy regularly. Food service operators where there is an on-going need to buy equipment and supplies. HR departments that depend on staffing firms to fill jobs. Shipping departments that depend on trucking companies to move goods. Do the people simply call phone numbers out of the blue? No, of course not. They’ve done their homework to identify groups of businesses that would most likely be able to use their services. Is this a cold call? Technically yes, because they’ve never met the person they’re contacting. To me these are what I refer to as “targeted cold calls.” It’s to a business that could use what you’re selling, but that’s the extent of what is known. What I just described works perfectly for the person who is selling a frequently-purchased item with a shorter sales cycle. In these situations, the key to success is making more calls. Time doesn’t allow nor does it warrant doing research on each number before calling. Go ahead and throw arrows at me, but I’ll say this is a spot-on strategy for a lot more salespeople than people realize. You can argue they should research the business they’re calling before each call, but the fact is the time spent doing research doesn’t payout in more sales being made. For those of you selling items with a longer sales cycle and purchased less frequently, it likely makes sense taking two minutes to do some on-line research about the prospect before making the call. In these situations, investing time ahead of the call is prudent, but it doesn’t eliminate the fact the key is still picking up the phone and calling. It might be a cold call to you, but to me it’s an educated cold call. I could go on and on about how I feel about cold calling, but let me share a couple final thoughts. There are some of you who say a business should be built solely off of referrals. If that’s the case, then any new company or new salesperson would never have a chance of succeeding. I love referrals, but they can take time, and in the meantime, I need to eat. Second argument is the solution to prospecting is emailing people. Oh, joy, go ahead and send out 10,000 emails and let’s see what type of response you get. Relying on emails is for people too scared to pick up a phone. If you’re too scared to pick up a phone and you expect to close all your deals via email, then fine, I want to compete against you. I’ll eat your lunch, because you’ll never understand the needs of the customer without engaging with them. You’ll find yourself serving up price quotes the prospect then uses with your competitor to get a better deal. The deals you do close will be driven by price, not any type of a value proposition. Final argument people say is the key to prospecting is with social media and in particular “social selling.” I’ve said it before and I’ll say it again — I can’t eat clicks, likes, and retweets. Social media is fine for building awareness and yes social selling has some potential, but don’t kid yourself — all of your prospects are not on social media! This blog post is an example of social media, and the ensuing discussions I have with people can be referred to as social selling, but that alone is not going keep my pipeline full. It’s your turn. Let me have it… pros and cons… I’m ready for it. If you’re serious about prospecting and I know you are because otherwise you wouldn’t be reading this article, then join me and a few sales peers as we discuss prospecting and your pipeline at the Virtual Sales Kickoff 2017. Jeb Blount, Anthony Iannarino, Mike Wenberg and I are excited to give you tips you can put into effect immediately. Go to this link to find out more. Even if you can’t join join live, sign up to get the replay link. Special thanks to Cirrus Insight for making the event possible. 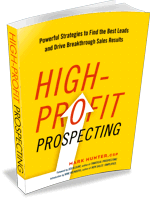 PrevPreviousThinking About Prospecting is Not Prospecting. It’s Not. Thank you for the reinforcement in my belief of, if not face-to-face, then voice-to-voice communication with a prospect. My closed sales are so much higher when I’ve spoken to or met the client in person. It seems harder and harder to get clients to meet in person or pick up the phone. I have learned to put the clients that are willing to the above, ahead of the rest in our desing queue. The closed sale ratio is much higher. I am involved quite a bit is selling to the C-Suite. At that level, e-mails almost never get returned; phone messages almost always get returned. Even if the person returning a call is a gate keeper who says “Go Away!” at least I have the opportunity to establish a professional tone and potentially charm my way into a conversation with the intended sales target. I have to agree with you, Mark. Although this day of age introduces more and more sophisticated software applications and solutions, we cannot still discount the value of cold-calling. Like what you said, WHEN DONE RIGHT, cold-calling still and definitely seals the deal. Spot on. Cold calling still works. Thanks. Read and appreciate your post. I wish cold calling wasn’t dead. But having experience today with cold calling it’s impossible to get anyone on the phone. You can spend countless hours calling and getting to talk to no one. It works for most companies that pay there sale people commission only. Sure, what do they care if you spend all day calling and never get to talk to anyone, it doesn’t cost them anything. And if by chance they do make a sale, great, found money. You must admit thing are changing and new way are proving more productive.